April 26, 2010, DY Patil stadium Mumbai, India, DLF IPL finals: Team Mumbai Indian announced first name “SACHIN RAMESH TENDULKAR”. Crowd danced to the tunes and was happy to see the god again on field. The expectation of Mumbai crowd was to win the cup and bring pride and honor to city. Every one knew a tiger with 5 stitches on left hand and right hand having swelling can barely go for a kill. But if some one could rise to the occasion and say “Yes I will..” it can be Sachin only. The passion for the game is so huge for this person that even if he had a fracture also he would have played for his team and for the nation if needed. Presence of this person is so huge on teams performance that he becomes the central driving force for which ever team he plays. But by mid night Mumbai Indians lost the match and I happened to read some reviews and few people commenting that Sachin can never perform on biggest stage and big matches. They even went on to say that his dream to win world cup for team India will remain a dream only. The god again broke our heart and he might have all the records but he might not be the greatest player. I really feel pity for those who think so. Its not about the endless record that Sachin holds makes him great. Its what he does and the way he does it makes him great. To answer them let me put before you some facts which people overlooked. Sachin sponsors 200 underprivileged children every year through Apnalaya, a Mumbai-based NGO associated with his mother-in-law, Annabel Mehta. Sachin along with Mumbai Indians supported Education for all, where in his team was involved in educating under privileged children from Akansha foundation. April 17, 2010, Chinnaswamy stadium, Mumbai Indians about to play Royal challengers Bangalore, all of sudden two blast on the gate of stadium, chaos everywhere, players and crowd gripped by fear. KP, Kumble lost a hope for match. Police rushed to the stadium took situation under control found another active bomb, but was diffused safely. Now when you know its bomb all around you and not even sure that if you play on stadium will you be playing cricket or your life. Fear all around you how can you play? Although the police assured that stadium is safe for play but players specially the foreign players not sure to play or not to play. Only god can help them survive this difficult, this is what happened. Sachin convinced Anil to play the game as he knew the best answer to terrorism could be by playing the game and making people believe that there is nothing to fear for, Sachin was also actively involved on convincing other players and make a match. The first person to step in to the stadium after it was announced that the game is about to start was Sachin, mind you it was home town for Anil Kumble and Rahul Dravid. This is what makes him to lead from front , this is where he is above rest. The crowd in stadium forgot that they have just seen a blast, but were entertained by a good cricket match. Post match, Anil was upset with the blast but Sachin put the game above all. This is why he is different this is why he is god. Few months back, he was dragged in political arena by Mr Thackrey for just an interview where he said He is a proud Indian, and Mumbai for all. I wont call the politicians silly cause they are meant to create such controversies, but the whole nation responded in one voice and gave them the reply that they wanted. He never spoke a work mind you. This is the influence of this player. Its not just out of field that Sachin faced controversies, he was banned for one test match in 2001 for ball tempering by match referee Mike Dennes , to which not only Indian cricketers but also the world over cricketing fraternity revolted. This is what the reputation of this player is. Time to time bowlers came and challenged Sachin, be it Abdul Kadir, Waqar younis, Shoiab Akhtar, Shane Warne, Hennary Olonga or Flintoff, this batsman has answered all of them with his bat, he never staked high claims he believed in actions rather than words. To some bowlers the extent of damage was so huge that they have to say in a joke that this player comes in his dreams also. This is the extent that god can be devastating. Who can forget 1999 world cup an emotional moment for this player, when he lost his father. He attended the last ceremony and was back on field in no time and slammed a century to dedicate this to his father. How can you question the commitment of this player?? Year 2007 ICC T20 world cup team was to be announced, he was the key in convincing all the senior player to stay away and make way for young guns to perform in this format of game. People have raised eyebrows on the performance of these players in this format of the game. 2010 IPL 3 years later today all of them came back strongly and today team selectors are behind the senior player to join the team. 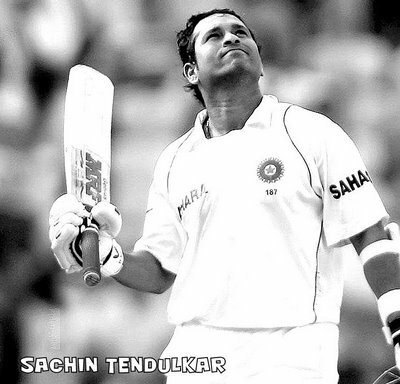 Sachin is in prime form in this form of game and has raised the standard of the game. To end with I will only say : Sky isn’t always blue and sun doesn’t always shine, then how can you expect this human to be right all the time”. No matter what conclusion people make but this player has entertained India for past 21 years. He has given all the reasons to smile and cheer and enjoy this lovely game Cricket. No matter even if his dream does not come true he is god and if anyone has any doubt then he is an atheist. Today if a father sees his child playing cricket he just dreams that one day his child becomes Sachin Tendulkar. But it takes lot more to be Sachin, the character Sachin and the brand Sachin can be once in a lifetime. Its not just the on field performance that makes this person great but it’s the off field deeds and the character which he shows makes him great. For others he may not be the all time performer or the match winner, but a player with so much guts and passion for more then 20 years can only be said as “GOD”.